Buy Gilding Knives for Sale here. These are Knives tools to Cut or Trim Gold Leaf. Gilders use a Knife and a Gilders Pad to cut gold leaf. Gilding Pads are typically made from softened doeskin resting on a soft pad attached to wood. Gilding Knifes do not require very much pressure when cutting gold leaf, because precious metals are thin. Cut gold from the bottom of the book so you don't mar the rest of the gilded leaf. If you do cut from the top down, you'll get a mark on every subsequent piece. that you can't remove even with cotton burnishing. Gilders Knifes must be sharp, dull or over sharpened will snag the gold when you push down lightly and pull to cut gold leaf. If you were to look at a over sharpened gilders knife under a microscope, you would see stress cracks or fissures. 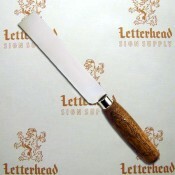 If you don't have a sharpening stone, in a pinch you can keep 600-800 grit sand paper to sharpen your gilding knives.